﻿ Best Price on Banana Beach Resort in San Pedro + Reviews! 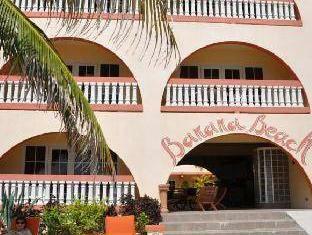 Featuring 2 swimming pools and a furnished terrace, Banana Beach Resort is set in Tumbo Beach. A transfer service is available to San Pedro Airport just 1.2 mi away. Free BB Breakfast Special is offered. The rooms and suites offer modern décor, air conditioning, a desk, fridge, cable TV and balconies with garden views. The bathrooms include hairdryer and shower. El Divino Caribbean Steakhouse serves breakfast, lunch and dinner with imported steaks, seafood, snacks, salads, lobster and a variety of worldwide wines. The Martini Bar features snacks, burgers, martinis and tropical drinks for the guests. The Banana Beach Resort can arrange activities like snorkeling at Hol Chan Marine Reserve, diving in the Blue Hole and tours to Ancient Mayan Ruins. Golf carts, bikes, jet skis and kayaks are available for rent. Massage service is available. With your accommodations, we offer a complimentary breakfast for two. This complex is 1.6 mi from The Belize Chocolate Company and its Cacao Farm, and 1.9 mi from San Pedro Church. The San Pedro Belize Express dock is a 20-minute drive away. Deposit/Payment Policy: To confirm a reservation the Full Amount would be due 30 days prior to your arrival. For arrivals with in 30 days we request payment in full to confirm a reservation. PLEASE NOTE THAT UPON CHECK IN YOU WILL BE REQUIRED TO PRODUCE AN IMPRINT OF THE EMBOSSED CREDIT CARD YOU PROVIDED TO MAKE PAYMENT FOR THE ACCOMMODATIONS. Cancellation/Refund Policy: There are no refunds for cancelations of 30 days or less. There are no refunds for later arrivals or early departures. No refunds for no shows or unused portions of accommodations or packages. There will be no refunds due to airline delays, strikes, or weather-related delays or cancelations, including hurricanes. Please note that we will be charging the credit card you have provided trough Booking.com, 30 days prior to the arrival date. Once you arrive here on the island, you will need to take a land taxi to the resort. The taxis normally park right outside the terminals. Just grab one, have them bring you to Banana Beach and we cover that taxi ride fare. Please note that the BB Breakfast Special is available for all Single or Double occupancy stays, per room type. The BB Breakfast Special will also be applicable only to extra people, ages 13 and up, who pay the Additional Person Fee. BB Breakfast Special will not apply to extra people ages 12 and under. Belizean Breakfast Special: includes 2 Eggs in any Style, potatoes and bread, Coffee or Tea and Juice of the day. Guests are required to show a photo ID and credit card upon check-in. Please note that all Special Requests are subject to availability and additional charges may apply.